Iron overload is a significant complication in patients with hereditary hemolytic anemia (esp. sickle cell disease and thalassemia) and hereditary hemochromatosis. LJPC-401, a synthetic form of endogenous human hepcidin, is being developed as a therapeutic intervention for iron overload in these conditions. To determine the safety, tolerability, and pharmacokinetics (PK) and pharmacodynamics (PD) of escalating doses of LJPC-401 in patients at risk for iron overload. This was a phase 1, multicenter, open-label, dose-escalation study. Patients (aged 18-85 years) were eligible for enrollment if they had one of the following: transfusion-dependent anemia (with blood transfusion [≥2 units in the past 2 months or 4 units in the past 6 months]; iron chelation therapy in the past 6 months; serum ferritin >1000 μg/L, or hemochromatosis (requiring phlebotomy at least once every 2 months or iron chelation therapy in the past 6 months). Patients were assigned to receive LJPC-401 at doses of 1, 5, 10, 20, or 30 mg. A single subcutaneous injection was administered on day 1, and dose cohort escalations occurred only after the final patient at each dose level had been observed for ≥3 days with no evidence of study drug–related toxicity. Safety assessments included treatment-emergent adverse events (TEAEs), physical and laboratory evaluations, and immunogenicity. PK parameters of baseline corrected serum LJPC-401 were obtained by noncompartmental analysis, with blood samples collected at predose and at 0.5, 2, 4, 8, 24, 48, and 168 hours postdose. PD endpoints included effects on serum iron, ferritin, transferrin, iron-binding capacity, and transferrin saturation. Eighteen patients (55.6% female; 66.7% white) were enrolled and completed the study; 7 had hemoglobinopathies (sickle cell disease or thalassemia) and 11 had hemochromatosis. Sixteen patients (88.9%) reported TEAEs (34 mild and 4 moderate in severity). Rates of TEAEs were similar across dose groups. The most frequently occurring AEs were injection site reactions (66.7%), nausea (11.1%), increased alanine aminotransferase (11.1%), decreased appetite (11.1%), and hypoesthesia (11.1%). There were no severe TEAEs, no TEAEs leading to early discontinuation, and no deaths during the study. One serious AE (sickle cell crisis) was reported but was not considered treatment related. Following LJPC-401 doses of 1 to 20 mg (but not 30 mg), the maximum serum concentration and area under the serum concentration-time curve from time 0 to 24 hours postdose increased with dose. Peak concentrations occurred at ~2 to 4 hours postdose for all doses. 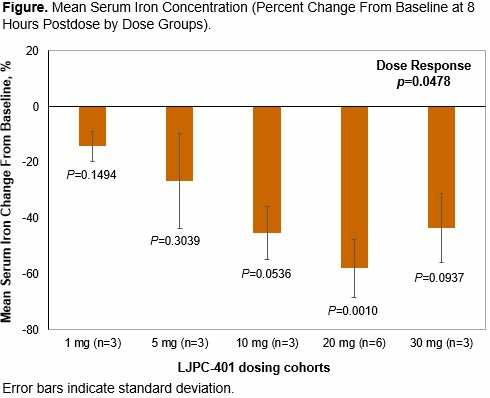 A larger reduction in serum iron was generally associated with increasing LJPC-401 doses up to 20 mg (Figure); at 30 mg, the magnitude of serum iron reduction was lower than that at 20 mg. Overall, there was a statistically significant dose response across the 5 dose groups (P=0.0478). Serum iron reductions were sustained up to day 8 in most patients. Data from other iron parameters will be presented. LJPC-401 was well tolerated at doses between 1 and 30 mg in iron-overload patients, and showed significant decreases in serum iron levels compared with baseline, which were sustained in most patients up to 8 days. In healthy adults (abstract submission by Yaeger et al), LJPC-401 showed decreased serum iron levels that returned to baseline levels within 48 h. Additional studies are planned to further explore the iron-regulating effects of LJPC-401 in patients with iron-overload disorders.